Around my house, we are pretty much as decorated as we ever will be. We don’t go all out on the decorations, but we always have a few Christmas trees and lots of ornaments! This year, my little brother Quinn was probably the most excited out of everyone about the decorating. He wanted to help me out and take some pictures with our decorations for this post! We have three Christmas trees, a big one that goes in the living room, and two smaller ones that go in each upstairs bedroom. Quinn has a green tree with mainly red and white ornaments in his room, and he loves it! His favorite ornament is a mini snow globe that hangs by a red ribbon. I absolutely love pearl and leather necklaces. They have become really popular lately, and they are so cute! Since they are made of just a few pearls and black or brown leather, the design is pretty simple. They match with everything and can really add detail to an outfit! I found a great company that sells these necklaces, and for a great price too! The company is an etsy shop called Sunkissed Earth, they sell many adorable styles of necklaces! This shop sells all sorts of cute accessories, but I was sent three of the necklaces from the leather and pearl line. The packaging was adorable, two of the necklaces came in a little woven pouch, while the other necklace came in its own gift box! This holiday season, everyone is making lists, decorating, visiting family, and making lots of yummy food. While all of those things are very fun to do, there is a much bigger meaning behind Christmas. Some people don’t have enough money for Christmas presents or Christmas dinner. Others might be cold and without heat or blankets during the winter. There are so many things to do this holiday season to give back to your community. exhausted. Here are some study tips to help you do the best you can on your exams. It’s officially exam week, so that means studying, studying, and more studying. Thankfully, I didn’t have an exam this afternoon, so I got checked out before lunch and came home so I could have some extra time to study. I had been sitting at the table, taking biology notes and quizzing myself. When my brother went to check the mail, I had no idea what would be waiting for me! He carried inside a box addressed to me, and he was so excited to help me open it and find out what was inside! The package was from Ashley Nicole Designs, a company that sells beautiful pieces of jewelry. I was so surprised to discover three leather and pearl items. There were two different styles of necklaces, and a beautiful knotted bracelet. It immediately brightened my day, and I was so happy to try everything on! The first necklace that I got is the All Around necklace. What is really crazy is that this necklace was actually on my Christmas Wishlist, and I had no idea I would actually be getting one! I love it because it is a simple, choker style necklace with beads and knots encircling the entire necklace. It looks so good with pretty much everything! Since Christmas is coming soon, everyone will be making lists of what they really want. I always make one list of things that I want, and then split it up to tell different grandparents, siblings, or my parents. Some of the things on my wish are a bit pricey, but others are some things I’ve wanted forever and just have never gotten. Read on to discover my Christmas wishlist! The thing I want the most is an ENO hammock. It was also on my Fall Wishlist, and I still haven’t gotten it! There are lots of trees and woods around my house, so I live in a perfect place for a hammock. I would love reading or looking at my computer in it in the fall and winter, hanging out in it in the spring, and in the summer. I would use it all the time! I have a humongous fluffy comforter that you could literally sink right into. I plan on filling the hammock with the comforter and sleeping out in it in the summer. I really hope I get it! Today’s Fashion Feature is on a hat company called Harding Lane. Harding Lane is the company who first started the “needlepoint hat” They also sell key fobs, belts, wool hats, and t-shirts! This company was so kind to let me review one of their products in a post. I was so happy to receive the hat in the mail and show it off! Christmas Is Coming- Now What? There’s less than a month until Christmas 2015! How exciting is that? Time sure has gone by fast, and hopefully these next few weeks of school will zip by. Then, it’ll finally be time for family, travel, presents, and fun this holiday! Read on to discover how to get ready for the upcoming season. If this won’t get you in the holiday spirit, I don’t know what will! 1. Make a Christmas List. No surprise there. Making a Christmas list of all of your most- wanted items is a must. This year, make it a bit more fun. Make a Pinterest board of your wishlist, that way you can have the links and pictures to everything you want. It’s easy to send the link to family and friends if they need any ideas. It’s also fun to make lists on what you’re going to get everyone else in your family. Having everything neat and organized makes it all the more enjoyable. Now that the holidays are drawing closer and closer, it’s time to bring out the lists. One list of all your wants this holiday season, and one list for all your family and friends’ wants this holiday season. Having trouble thinking of things to ask for/give? Check out these holiday gift guides! 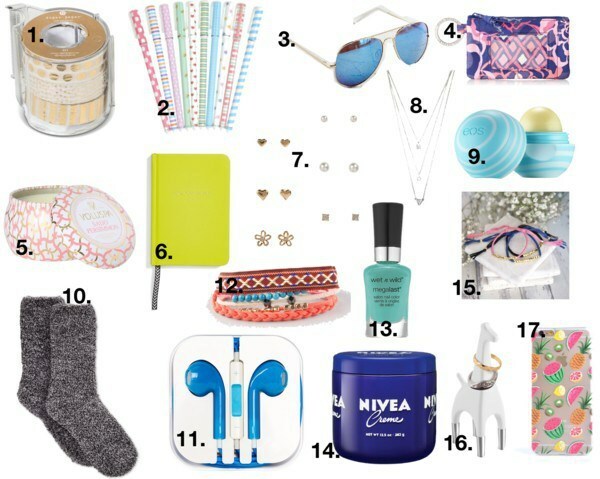 Below are some amazing stocking stuffers, all for ten dollars or less! From phone cases to mini candles, these little gifts are sure to make any stocking fantastic! And ten dollars or under, it’s such a steal! Ivey Parks is a new company that sells adorable clothes, accessories, and swimsuits. They recently chose the first brand reps for their company, and I was so happy to be picked! You could find some perfect Christmas presents at affordable prices If you are looking to get free shipping on your entire order at Ivey Parks, be sure to use my code “addiethomp”!